In Krav Maga, we recognize that most situations start from the feet. But there’s a well-known adage that says, “Most fights go to the ground.” Violence or threats can often occur while we are walking, in an enclosed space, or even sitting with our feet on the floor. They can go to the ground in a heartbeat if we are not paying attention, or if we do not execute our training correctly for some reason. We have to remember that our first line of defense is always our mind and judgment. Always, always be aware of your situation and potential threats to your safety! A little vigilance goes a long way in preventing situations from escalating to physical violence against us or our loved ones. Training. We’ve got You Covered! When threats do become physical, we need to know what to do, whatever our position of advantage or disadvantage is. And when a person is able to engage us in grappling, limiting our ability to strike and maneuver, we need to be prepared. Fortunately, here at Krav Maga San Francisco, we’ve got you covered! In addition to rounding out the self-defense and fitness classes at Krav Maga San Francisco, our Brazilian Jiu-Jitsu and Krava Maga Ground classes teach us how to train our bodies for grappling. Both are open to beginning and advanced students. If you’re looking to build more awareness into your muscle memory, these are the classes for you. In Krav Ground, we learn defenses against takedowns, reversals from the ground, and techniques to get up from the mounted position. Our battle cry from the ground is always to “Get up!” Sometimes, we throw strikes like elbows and eye strikes in training to make that battle cry a reality. Jiu-Jitsu classes, on the other hand, help us explore the mechanics of limb and weight manipulation against opponents who may be more technical. We also learn more grappling offense, which really can help improve our confidence in full-contact grappling situations. 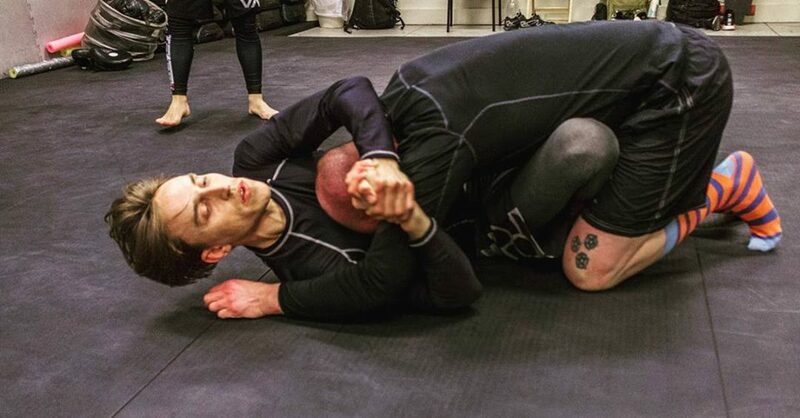 The addition of submission holds and chokes gives us a chance to go all out and learn how it really feels to be caught in a situation that requires strikes to get out of. So whatever training a situation requires in unarmed, or even potentially armed combat, we’ve got you covered. Come check out the Krav Maga Ground class on Wednesdays at 6:30, and Brazilian Jiu-Jitsu (with Ralston Gracie) on Tuesdays and Thursdays at 7:30. With these classes, we always have the tools to improve our grappling confidence and ability. Walk in peace, and Kida!